What is a VinoPaint event? The VinoPaint experience is all about SMArt events! – Social Meetings and ART where you can create your own masterpiece in a relaxed, stress-free group environment. We often hear “I am not artistsic”, or “I can’t even draw a stick figure”. Well, have no fear! This is the perfect event where absolutely NO experience is necessary to have a amazingly creative and positive time. Our instructors are professional artists that will guide our guests through the evening’s painting event with simple, step-by-step instructions. Perhaps you are an aspiring Georgia O’Keefe or Pablo Picasso just looking to explore your creative side and color outside the lines, you get to take home a painting that is personally “yours” that you made yourself. What is included in the event price? The cost for our VinoPaint events range based on the type of class or workshop. We provide all the materials for you to use to create your personal masterpiece or project. The painting classes includes your own pre-stretched canvas, pains, use of brushes, easels, apron, along with a wildly fun local professional artist to guide you thought the artistic process. There are times we have early bird sign up savings available on our Facebook Page, be sure to “LIKE” us. Get on our VIP list, sign up here to be on the front lines of new classes, workshops, updates and more! Are reservations necessary or can we pay at the door? 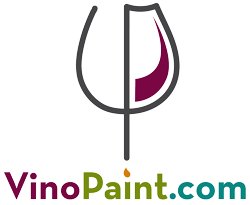 VinoPaint events tend to book up quickly, so it is recommended that you register in advance to secure your space. We can accept walk-ins on a first-come, first-serve basis if we have space available. Be sure to always check the website for real time event status and it is always being updated with new dates and venues. Having you create the painting along with the rest of the guests is all part of the fun! Attendees help encourage others and cheer each other on – it makes the event more festive and keeps the positive vibe upbeat! We like to encourage our attendees to paint the featured painting, Most people sign up to paint the featured artwork, so our instructor’s number one priority will be guiding attendees with the featured painting. If you decide to paint your own theme or style, that’s fine, however please be respectful to your fellow artists as well as the instructor of the event. VinoPaint events are open to ages 16 and over. Typically since the VinoPaint events are held in wine bars and restaurants, this will vary by location and by the class or workshop. Most events are targeted for 21 and over. Please feel free to contact us if you have a question or would like to plan a private event. Please dress appropriately. We provide aprons to help protect your clothes to a degree, however we cannot be responsible for any clothing or accessories that might be blemished by a paint smudge or two. Please take this into consideration when you decide what to wear for our canvas painting sessions. Every new artist must know that wearing your best outfit might not be suitable for this activity. We use non-toxic acrylic paints, and while these are water based paints, they are not entirely clothes friendly. Please dress appropriately. We provide aprons to help protect your clothes to a degree, however we cannot be responsible for any clothing or accessories that might be blemished by a paint smudge or two. Please take this into consideration when you decide what to wear for our canvas painting sessions. if you are coming straight from work, just bring a change of clothes. Since our paint is non toxic, you may get some paint on your hands. In the event that you have sensitive skin or a nicely maintained manicure, we can provide plastic disposable gloves available upon request to protect your hands. The paint we use is non-toxic easily washable from skin and nails with soap and water. Can I take my painting home the night of the event? Yes, yes, yes!!! You take your painting home with you. We also want your masterpieces to arrive home safely. Acrylic paint dries rather quickly, however we do not want your newly created painting to leave paint smudges on the seats of your vehicle. We suggest bringing an old towel or plastic trash bag to protect your automobile. Refunds can be honored 7 days before the scheduled VinoPaint event. This is non refundable within 7 days of the scheduled event. If you cannot make your event, your registration may be assigned to a family or friend. We require your email authorization for this transfer and the names of the individual(s) taking your place. We must adhere to this policy based on the instructor and the venue for these pre-registered events. Consideration may be allowed to apply your registration to another event, this is a case by case basis and you must contact us in ahead of time in writing. May only be applied within 60 days of your cancelled event. No refunds are given for ‘no shows’. More information can be viewed on the Terms and Conditions page. What form of payments does VinoPaint take? We take credit cards, cash and checks (checks only for larger contract based events). We use PayPal as our payment provider. Since VinoPaint is a component of Sonya Paz Incorporated, your billing statement will be from “Sonya Paz Incorporated”. If you have any questions or concerns about your banking statement or the charges from your bank, please contact us at 408-378-5000 before addressing any disputes with your bank. We do prefer to have attendees sign up via the website because of the automated system that we have. If you need to make a payment via cash or check, please contact us so we can assist you personally. You may also call us at 408-378-5000. How will I know if I am registered if I paid online? Once you have completed your VinoPaint registration, you will be automatically notified via email with your receipt and statement of purchase. You will also receive your tickets via email. Please print those out -or- you can bring your smartphone with the ticket code to check in to our events. If you have not received your confirmation or tickets in a couple days of registering, please contact us directly. Occasionally we have coupons (promotional codes) as well as sales for our events. These occasionally offered for larger groups and special events. You can check our event information on our website or from our Facebook page. We promote these specials to our referrals and to our own mailing list as special thanks for attending a previous event. Many of our events are on sale already and the promo codes may not apply to events that are already on promotional sale. We are not presently affiliated with online coupon companies like Groupon or Living Social, so be sure to check our website, join our mailing list and like our Facebook page to view the most current promotions. If you have any additional questions please feel to contact us.